Our optometrist at Eye Associates uses state-of-the-art diagnostic technology to treat eye disease and provide medical eye care. Our personalized service includes customized fittings of a wide selection of glasses, sunglasses and contact lenses. 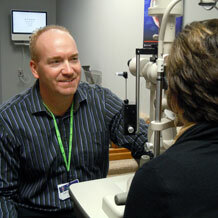 Eye Associates has clinics in Atlantic and Audubon.